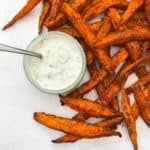 Crispy baked sweet and smoky potato fries, accompanied by a refreshingly light tzatziki dip. Whether you are making these for a fantastic feast or as a sensational side they are a real winner! Vegan, GF & healthy. Preheat the oven 180°c fan/200°c/400°f. Top and tail the sweet potato before cutting it into long thin fries about 2cm thick. Place the fries into a large bowl and add the olive oil and all the seasonings. Use your hands to mix the everything together so that all the fries are evenly coated with spice mix. Transfer the sweet potato fries onto a lined baking tray and evenly space them so that they are not touching one another. Bake in the preheated oven for 50-55 minutes turning once half way through until crispy on the outside and soft in the middle. Allow the fries to cool on the baking tray for a few minutes before sprinkling with a little more sea salt and serving with the tzakziki dip. Cut the cucumber in half lengthways and scoop out the seeds. Finely chop the remaining flesh and add it into a bowl along with the yoghurt, mint, garlic, lemon juice and a pinch of sea salt. Give everything a good mix and taste to adjust the seasoning accordingly. Store in the fridge until ready to serve. This recipe serves 2 people generously as a side dish. It can be easily doubled / tripled etc. depending on how many you need to feed. Remember for ultimate crispiness that the fries need to not touch one another whilst baking, so 2-3 trays may be necessary if making more than one batch. These sweet potato fries are best consumed when first baked. Left over tzatziki dip will keep perfectly refrigerated in an airtight container for up to 5 days. I prefer to keep the skin on my fries because it is rich in nutrients and I like the chewiness it brings. These fries work just as well without the skin though so feel free to peel them before cutting in step 1. If you aren't a fan of tzatziki and don't want to just settle for ketchup on mayo why not have them with hummus? Don't knock it till you try it - they go together surprisingly well! I have a good recipe here. A recommend using a good quality olive oil for these sweet potato fries. They also work really well with avocado oil if you have it. I like using sea salt as it has better flavour and is less processed than table salt. If using table salt only use 1/2 tsp.